The thoroughbred industry is in collision with the coal industry over land use, prompting the NSW government to legislate a long term strategy. The end result appears to be balanced but is actually a big win for the powerful mining companies. 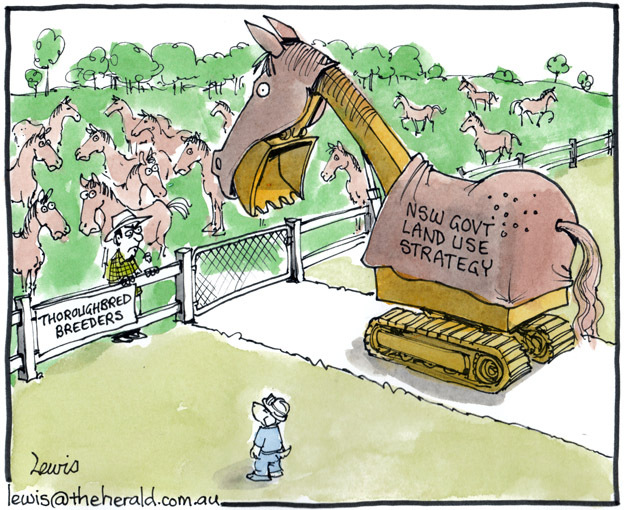 This entry was posted in Editorial Cartoons and tagged australia, coal, environment, environmental activists, farms, horses, industry, land use, liberal, strategy, thoroughbred on November 29, 2012 by Art by Peter Lewis.